Ed is selling his cherished Mule, in Boulder, Colorado. This is the genuine article; custom-built by Richard Pollock of Mule Motorcycles! The bike is named “The Big Package”, and it can be viewed on the Mule website at: http://mulemotorcycles.net/the-big-package.html The bike was originally built as a no-compromise electric-start race bike. Parts include: Buell 1200cc S1 engine, C&J flat track frame w/Penske shock. Grey powder coated 19″ Sun rims, A&A rear hub and adjustable fork crowns, Brembo rear brake, Andrews N8 cam, Mikuni HSR carb & dozens of beautifully conceived and executed one-off Mule pieces. Ed is the second owner, and has added lights, mirror, kickstand, horn and a new front end consisting of: Buell fork legs, Kosman hub and disc, and a Brembo brake caliper. The bike is Colorado plated, and in fantastic shape. Tires are non D.O.T. compliant Maxxis race tires. The bike does not have a speedometer. Paperwork indicates that it was built 2004 using an engine from a 2000 Buell. Ed has owned the “Big Package” for three years. Bike comes with the original fork legs and several spare sprockets. It is also wired for turn signals (which are boxed up and can be included in the sale). Richard Pollock from Champions Moto on Vimeo. BikeExif has the scoop on Richard Pollock’s latest creation, a custom build for an Australian customer. Article is here, go check out the beautiful pics! Mule Motorcycles from Champions Moto on Vimeo. “I like to build things”. Richard Pollock has been building bikes since 1969, and does it full-time now. Forget airbrushed skulls, daggers, grim reaper, instead think along the lines of clean, lean, and light. “I like to make the bikes more seamless, cleaner, and smoother”, said Pollock, via a local interview with the San Diego Union-Tribune. 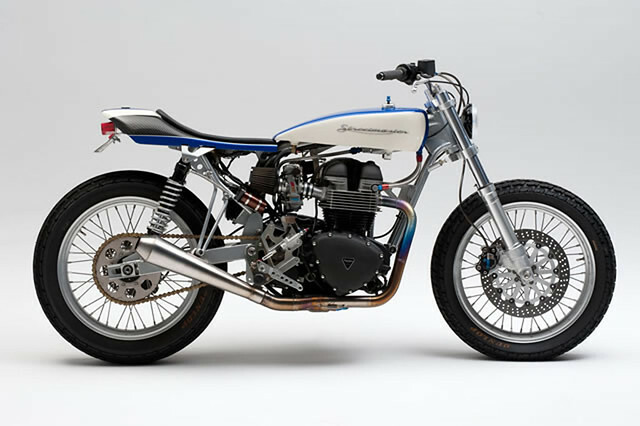 Pollock builds custom, one-off motorcycles, handmade, on his own timeline, typically a year or so. One of his bikes took 6 years to build, named the XR-1660, a beautiful street-tracker. Interview with Megadeluxe.com, quite detailed and good interview. From the interview, Where did you come up with the name: Mule Motorcycles?